A: L'ORÉAL Professionnel Vitamino Color [Expert série]- color protecting shampoo. It smells fantastic, and it has a double-protection system for coloured hair with incell hydro-resist (a UV filter for hair, including derivatives of Vitamin E and Magnesium). I wash my hair twice with this product before proceeding to B.
I use this hair masque as my conditioner. It's meant to stay in for 2-3 minutes, which is the amount of time it takes to comb my hair. It does not smell as floral as the vitamino shampoo; it's got a 'this means business' chemical smell, so you know it's going to work. The masque contains neofibrine- according to the tub that's "a unique combination of Bio-Mimetic Ceramide, natural wax, shine perfecting agents, and a UV filter". Basically, it's responsible for making my hair manageable, shiny, and quite soft. It's my favourite product from the five shown above. I won't swear by this product, but rather any styling product that's a mixture of gel & cream. It's the secret to defining my waves sans frizz. Frizz is the enemy, and I hate it. I just used the tecni art one a couple times while I was at the salon, and it's pretty awesome. The one I'm currently using (actually, it finished this morning) was from a drugstore brand. I'll most likely be purchasing the L'ORÉAL one this week. 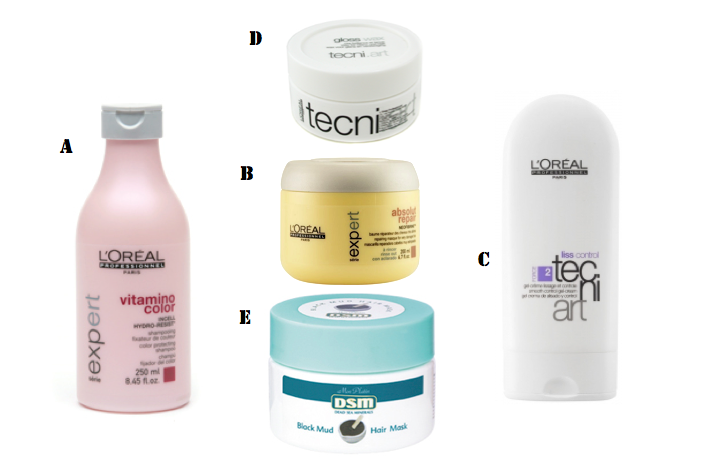 Gel creams not only eliminate frizz, but they do it without hardening your hair (only chips should be crunchy, ladies), and sans white residue. They're genius. I only use this after straightening my hair. It removes my tiny fly-aways whilst boosting my 'shiny hair' factor by 20. Great styling product, and it smells very lovely. This product is a b**** to find online, so I substituted the photo for the wax gloss... they're not the same product, but I'm sure they do the same job. Alright, let me tell you about Mon Platin: it's organic, it does not damage your hair or cause product build-up, and it's from Isreal. I used the DSM Obliphica line all winter because I was a) in love with the smell, and b) having trouble with dry scalp. With regards to the Black Mud Mask, here's some information that perfectly summarizes what it does, "Based on natural Dead Sea mud acclaimed for its revitalizing powers, the carefully balanced ingredients help stimulate hair growth. An ideal anti-dandruff treatment that helps combat sensitive scalp and hair loss. Contains aloe vera, jojoba oil, pro-vitamin B5 and Vitamin E." It smells like mint, and I use it whenever I take a bath; it's suppose to stay in for 10+ minutes. Quick tip: wash it ALL OFF, especially it you're using it as a scalp treatment. If not, your hair will get oily! ** Another aside, because Mon Platin is slightly harder to find in North America, high-end salons that do sell the products tend to jack up the prices 70%. Do your research, then purchase. These are REALLY AFFORDABLE good quality products (which is quite unheard of, anywhere), so don't get ripped off. thank you for passing by and leaving your sweet comment! it means a lot for me! remember you can keep in touch with my blog via blogger, bloglovin or facebook! Haha thanks hun! Not many read through the entire post to catch my weird little anecdotes. The quotes you put in your post titles always have me scrambling for my agenda so I can write them down. That is one gorgeous photo, even with the blurring.